Raccoona Sheldon. The Screwfly Solution. Originally in: Analog, June 1977. John Varley. In the Hall of the Martian Kings. 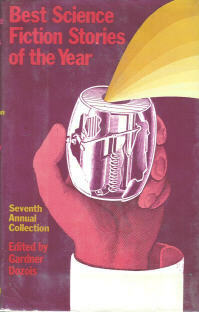 Originally in: Fantasy & Science Fiction, February 1977. Originally in: Analog, February 1977. Steven Utley and Howard Waldrop. Black as the Pit, from Pole to Pole. Originally in: New Dimensions 7. Michael Bishop. The House of Compassionate Sharers. Spider Robinson and Jeanne Robinson. Stardance. Originally in: Analog, March 1977.